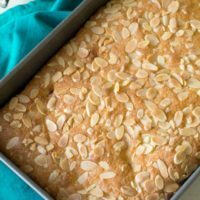 This fruity gluten free strawberry lemon bakewell tart recipe is a fun British cake that can feed a crowd. 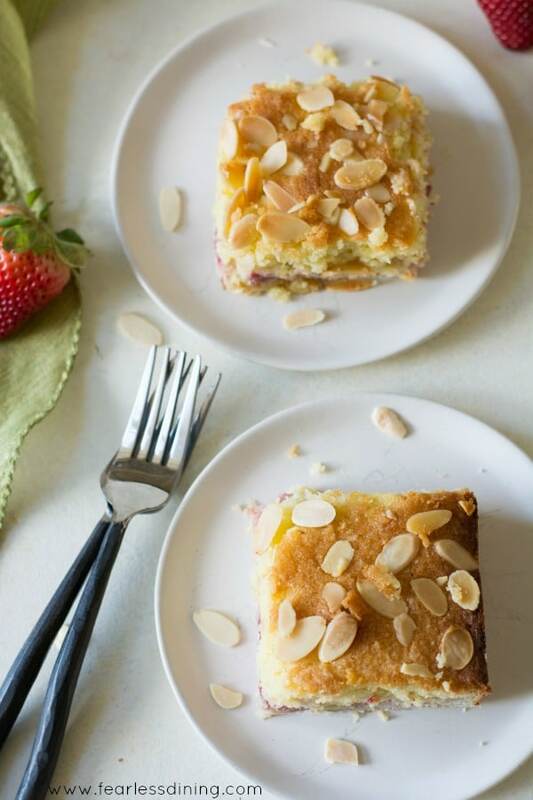 Filled with fresh strawberries and topped with almond slivers, this is a delicious classic cake. Light and fluffy, you will love how this gluten free bakewell tart just melts in your mouth. 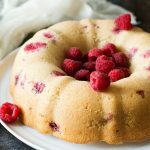 Don’t forget to check out all of my best Gluten Free Lemon Desserts recipes. They are sooo worth trying! What is a Bakewell Tart? If you have been to England, you may recognize a bakewell tart. They are a cross between a tart and a cake. You have a gluten free flaky pie crust bottom, with fresh fruit and a light cake-like top layer covered in slivered almonds. I was really lucky to meet a food blogger friend, April, from the U.K. The story is actually quite funny how we met. We were friends in a food blogger facebook group. One day I saw a picture she posted on facebook of her laptop, her feet, and a swimming pool. I recognized exactly where she was visiting… the pool in Santana Row. I sent an instant message and we were able to meet up for coffee the next day. That was two years ago. We have been lucky enough to get together several times now and we have become close friends. When April was here last week, we decided to get in the kitchen together and make a recipe from each of our blogs. 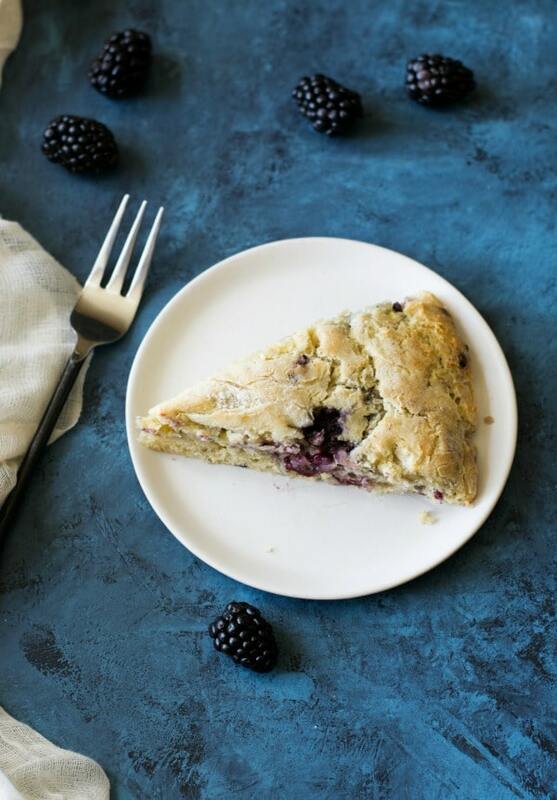 April has several readers who want to learn more about gluten free baking, and I taught her how to make these gluten free blackberry apple scones. April said American scones are very different from British scones. My scone recipe was definitely lighter than a dense scone she talked about. 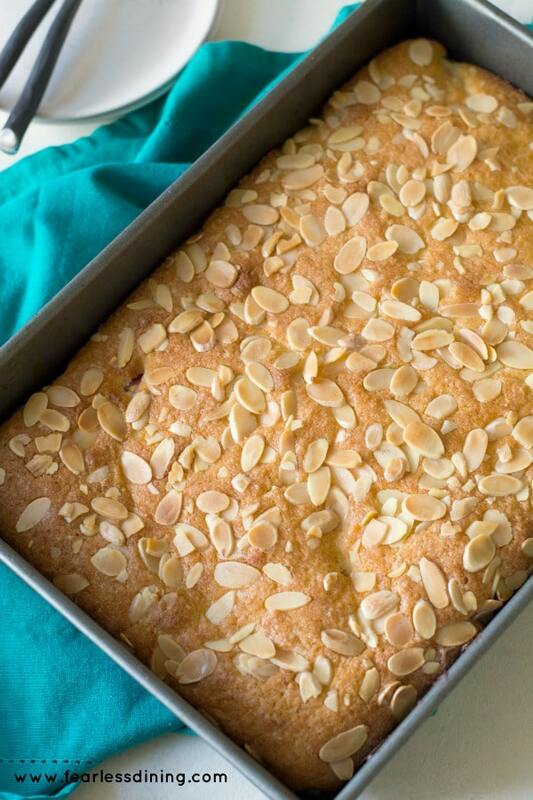 This bakewell tart “cake” is big and feeds a crowd! I will say there is a lot of butter in this tart, almost like a butter tart. The upside is how this bakewell tart just melts in your mouth. Add in a bunch of lemon curd in this tart recipe, and you have a family favorite dessert. What fruits can you use in a bakewell tart? It’s absolutely delicious! Even better? 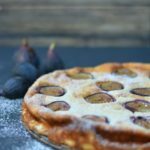 You can use any fresh fruit to make this gluten free tart. This cake is modeled after April’s Blackberry Apple Bakewell Tart recipe. Add the wet ingredients to the dry cake ingredients. Mix well. 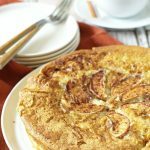 Mix the gluten free tart crust and press into a pan. Next spread lemon curd onto the crust. (I used Trader Joe’s Lemon Curd for this.) If you love lemon curd, you will want to try these Gluten Free Lemon Filled Cupcakes recipe!! Add your fruit layer. These fresh strawberries are giant sized. Can you believe how much space each slice takes up in this 9×13 pan? 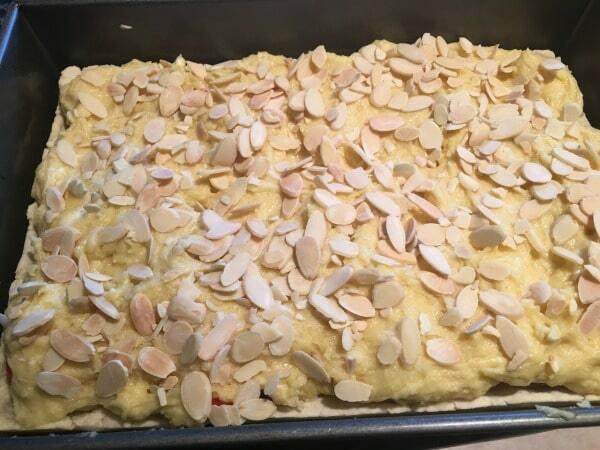 Top with cake batter and slivered almonds. Bake and enjoy! A non-stick 9×13 baking dish. Almond flour that is finely ground adds protein and moistness to this cake. 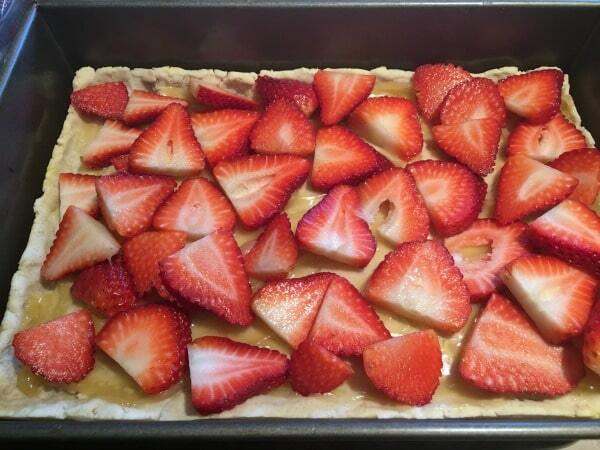 This gluten free tart crust recipe is easy to make, or you can buy a gluten free crust mix. Easy delicious gluten free strawberry lemon bakewell tart. Prepare the gluten free crust (link above for the recipe). Spread the crust into a 9x13 baking dish and bake for 5 minutes. 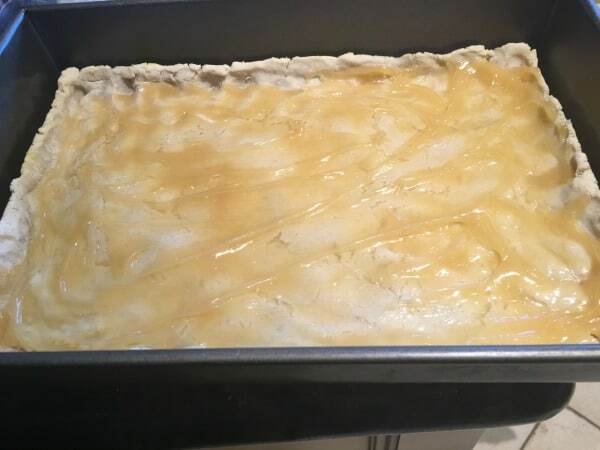 Remove from the oven and spread lemon curd onto the crust. Add the fruit layer on top of the lemon curd. 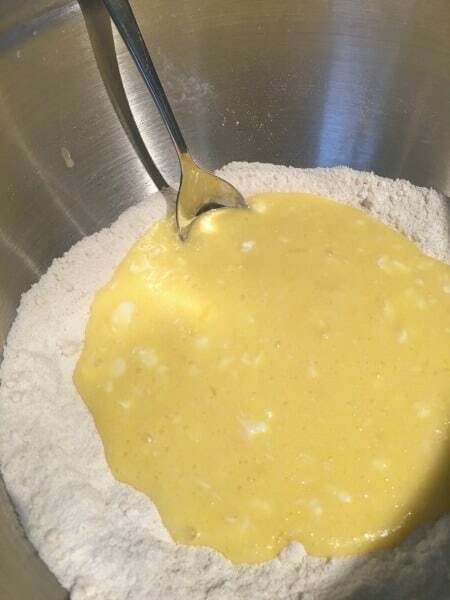 In a large bowl, add the first 4 ingredients and whisk to blend. In a smaller bowl, add the next 5 ingredients from lemon juice up to sugar. Mix well. Pour the cake batter onto the fruit layer and spread out. Sprinkle the slivered almonds on top. Bake for 30-40 minutes until the top is slightly golden like in the pictures. I don’t have a 9 X 13 so I used my 8 X 8 that taper in and a small loaf pan (3 X 5). This recipe turned out great. My friends loved it. However they know me for my lemon curd and this didn’t pack enough of that lemon punch for them. Next time I will increase that amount a bit. And possibly buy the proper pan by then. I bet your lemon curd would be perfect in this recipe. I am so glad your friends loved it! Hi Sandi, I posted about the egg being in the ingredients list but the recipe didn’t mention where to use it. I decided to take a common sense approach and leave the egg out as I have never heard of an egg being used in a crust recipe. That being said, I made the tart about an hour ago. It is awesome and even more delicious than I hoped. Light and fluffy cake on top. I made the recipe as you have it posted with the exception of the berries. I didn’t have strawberries so I used raspberries & Wild Maine blueberries. I added a bit of Almond Extract to the cake batter, And only increased the amount of lemon curd and berries slightly. It smelled so good baking. And when I took it out of the oven I couldn’t wait for it to cool. I let it sit for maybe a half hour and cut into it. I noticed in the recipe for the crust it has an egg listed but no where does it state when to put the egg in. Im confused and have my oven on, ingredients out and in the process of making this and I’m at a stand still.??????? Hi Doreen, I am so sorry, the egg goes into the wet cake batter ingredients. I will make that more clear. Thank you so much. Pet peeve of mine that people comment on how desserts look! I can see this for my self…I would love to hear from people who have actually made this dessert…how did it taste?! How did it turn out? Sorry just tired of comments with no real information! This tart is great. It’s so good it doesn’t taste like it is gluten free. My family loved it. I am so glad you liked this recipe Jeanne :-). Thanks for coming back to let me know! Meeting up with blogger friends is so much fun, but baking together sounds even better! This tart looks incredible! Love all those almonds on top! I love the flavors that you used. It looks great! I also love the crunch of the almonds. LOL, I know exactly what you mean. I felt like it was early for strawberries, but they are already so sweet. YUM! This tart looks and sounds amazingly delicious. 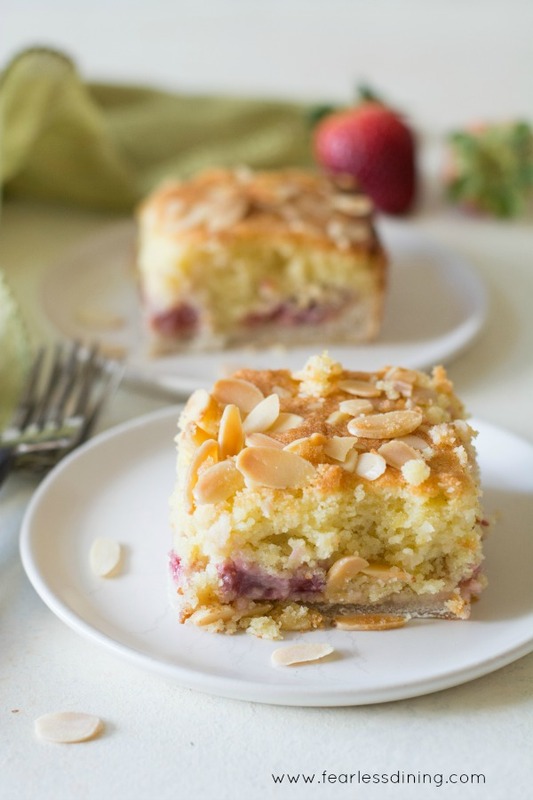 While I’ve never had a classic bakewell tart, I’m loving this combination of flavors in yours! What a wonderful way to start your day! This looks amazing! There’s nothing I love more than a good bakewell tart, I love the strawberry and lemon combined together, It sounds and looks gorgeous! Thank you so much Erren :-). I had so much fun cooking and learning about gluten free baking with you, Sandi! Love how this Gluten Free Strawberry Lemon Bakewell Tart turned out. It’s absolutely beautiful! Thank you again for making the Gluten Free Apple and Blackberry Scones with me. I love how they turned out too! I can’t wait to do some more gluten free baking when I get home. It was fun. We need to cook together again soon :-).